There are always performances early in the season that fly under the radar. But what Claudine Smith did last weekend flew right off the radar and landed in another country! In case you missed it, which you probably did because of where it happened, Smith, a senior at Atlantic City, turned in stunning performance in the 17-19 age division at the Jamaican CARIFTA Trials last weekend at National Stadium in Kingston. The CARIFTA Trials consists of athletes from 26 Caribbean countries. The Rutgers-bound Smith, who won the 55 hurdles at the Indoor Meet of Champions this past winter, soared a wind-aided (a whopping 6.0 meters per second) 41-6 1/2, the third best in state history in all-conditions and No. 2 in the U.S. this season, to place second. That smashes Smith's PR of 40-1 1/2, which she jumped to finish fifth at the New Balance Indoor National Championships in New York last month. The only NJ girls to triple jump further than Smith in high school are Olympian and American record holder Keturah Orji of Mount Olive (a state record 44-11 at the IAAF World Youth Championships in 2013), and Carlene Cummings, of Englewood, who went 42-2 3/4 at the 1998 Penn Relays to earn the Most Outstanding Performer award. Smith's 41-6 is No. 2 in the U.S. this season. Jasmine Moore of Mansfield Lake Ridge High in Mansfield, Texas is the national leader with a wind legal (2.0) 43-5 that she jumped at the Texas Relays. 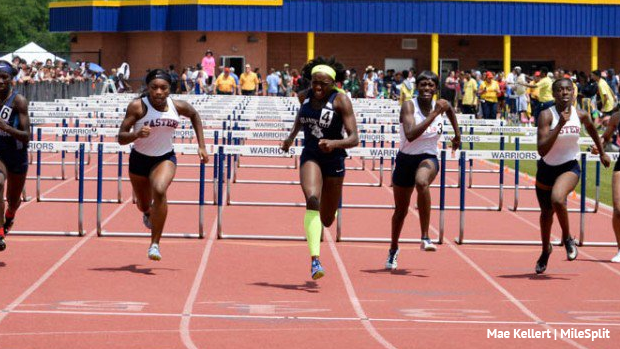 Smith also placed fourth in the 100 hurdles in a NJ#1/US#24 14.04, breaking her PR of 14.26 that she ran at the state Group 4 championships last year, and she soared 17-0 1/4 (-1.6 on the wind reading) in the long jump to finish eighth .